Over the past seven years, Uber and ride-sharing have taken the transportation world by storm, changing consumers’ transportation habits, and forcing cities around the country to rethink their own transportation systems. Uber’s troubles still get most of the attention. Last week, a federal judge ruled that a lawsuit by Google’s self-driving car division, Waymo, will go to trial. Waymo has accused one of its former engineers of stealing thousands of pages of trade secrets when he left, and taking them over to Uber. The judge rejected Uber’s claim that the dispute was an employment matter that should have been settled through arbitration. In the meantime, Uber is moving beyond its original approach of growing its customer base through individual customers. Some states and cities are ncreasing the role of Uber within their jurisdictions. Five Florida cities are subsidizing Uber rides, and providing further support by paying for rides to public transportation stations. A New York City proposal, if passed, would force Uber to add a tipping option for riders within the city. And Edmonton, Alberta has begun exploring a partnership with Uber and other ride-sharing companies, in an effort to replace bus routes. Last June, the Florida cities of Altamonte Springs, Longwood, Lake Mary, Sanford and Maitland, began their pilot programs with Uber. The five are located just north of Orlando, and aim to save money, reduce traffic congestion and increase ridership of their SunRail train system. The program subsidizes 20 percent of every Uber ride beginning and ending within the city. Trips that end or begin at a SunRail station are subsidized 25 percent, according to the Orlando Sentinel. These ideas are often referred to as “last-mile programs,” meant to bring riders to public transportation stations. Uber kept the amount of money it received from each city a secret until January, when a Longwood city clerk, Michelle Longo, released the invoices from Uber to the Sentinel. States Are Rushing To Raise Gas Taxes. Will That Be A Federal Solution, Too? Atlanta’s crumbling freeways. Photo via ABC News. America’s infrastructure is crumbling, sending states scrambling for ways to fund the rebuilding of their worn highway systems. Increasing the gas tax is a perennial solution, and now, it is getting attention from the White House. The federal government levies an excise tax of 18.4 cents per gallon of unleaded fuel and 24 cents on diesel fuel. States gas taxes vary from state to state, but range from a fraction of a cent to more than 50 cents on each gallon. The federal gas tax is not indexed to reflect inflation. It has not gone up since 1993, although inflation has risen by 64.6 percent. On May 2, President Donald Trump suggested the possibility of a federal gas tax increase in an interview with Bloomberg. “(I’ve) had the truckers come to see me, that if we earmarked money toward the highways that they would — that they would not mind a tax — you know, gas tax or some form of tax,” Trump told Bloomberg. According to the Federal Highway Administration, the U.S. has $836 billion in needed repairs and improvements to roads and bridges, plus an additional $90 billion needed to fix public transit systems, the AP reported. On Jan. 1, six states implemented higher gas taxes, including Pennsylvania, which raised its state tax on gas by about 8 cents per callon to 58.3 cents per gallon, and Michigan, which raised its state gas tax 7.3 cents to 26.3 cents per gallon. Nebraska, Georgia, North Carolina and Florida, also raised their state gas taxes, according to Forbes. Michigan also increased registration fees on electric cars, to counter for their lower gas consumption. California will implement a similar measure in November, along with a higher gas tax. So far this year, five more states have raised gas taxes, and increases are up for debate in more state legislatures. Comments Off on States Are Rushing To Raise Gas Taxes. Will That Be A Federal Solution, Too? A new study from the University of Michigan Transportation Research Institute shows Americans seem optimistic about, yet are skeptical of autonomous cars. The study surveyed more than 1,500 people who are 18 years or older in the United States, United Kingdom and Australia and found that Americans had a much more positive view on self-driving cars than those in the U.K. or Australia. So while the United States might have a population of people who are very excited about self-driving cars, it also seems to be the most skeptical about their benefits. When asked whether respondents thought self-driving cars would reduce crashes, 10 percent of U.S. respondents said it was very unlikely, while only 7.2 percent felt that way in the U.K. and 6.3 in Australia. Furthermore, U.S. respondents also had more skeptics on whether self-driving cars would reduce the severity of crashes. 10.4 percent of Americans found it very unlikely the cars would reduce severity, versus 6.5 and 6.3 percent in the U.K. and Australian respectively. Americans were also more skeptical about how much cost benefit self-driving cars would provide, finding that 18.6 percent felt autonomous cars would drive up insurance rates. Only 14 percent in the U.K. felt self-driving cars wouldn’t lower rates and 16.4 percent agreed in Australia. While the technology for self-driving cars continues to develop and may soon be seen on roadway, Americans might have difficulty relinquishing full control to computers as 60.1 percent of respondents they were very concerned about riding in a vehicle with no driver controls. Further, more than 50 percent said they were very concerned about self-driving vehicles getting confused by unexpected situations and about safety consequences of equipment or system failures. Of all the cities across the U.S., only one has landed in the top 10 of the world’s best transportation cities, according to Jalopnik. New York grabbed the final spot on the list for its historic subway system that, despite its age, has been able to stand up to quite a lot. An example: it quickly returning to service after being flooded during Hurricane Sandy. Germany has a strong grasp on quality transportation systems. Jalopnik put three of the country’s cities on the list: Berlin, Munich and Frankfurt. 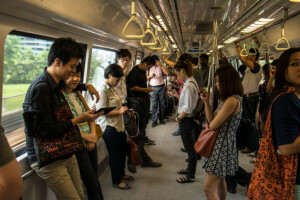 Berlin claimed ninth because it’s punctual and has quiet rail lines, and because the city is seemingly saturated with transportation. Google Maps has taken to documenting much of the world’s roads, and even some more ambitious routes such as the Grand Canyon, but Cyclodeo is the first to begin documenting the world’s bike paths. I particularly like the Golden Gate Bridge video, what a spectacular ride it would be. Explore the rest of San Francisco via bicycle here. Cylodeo allows users to explore bike paths from their computer such the Golden Gate Bridge in San Francisco. One city at a time, Cylodeo has gone about filming and routing bike paths in about seven cities in Europe and the United States. People will be out this weekend enjoying the holiday, and they literally can breathe easier. New satellite images from NASA show a drastic decrease in air pollution across the United States over the last decade. According to the images from NASA, it’s believed the improvement in air quality is from the improvement of fuel efficiency in cars and the scaling back of pollutants from coal power plants. Popular Science writes the reduction in pollutions goes all the way back to the 1990s after the Clean Air Act Amendment, but since 2000 there has been a roughly 50 percent decrease in levels of nitrogen dioxide. 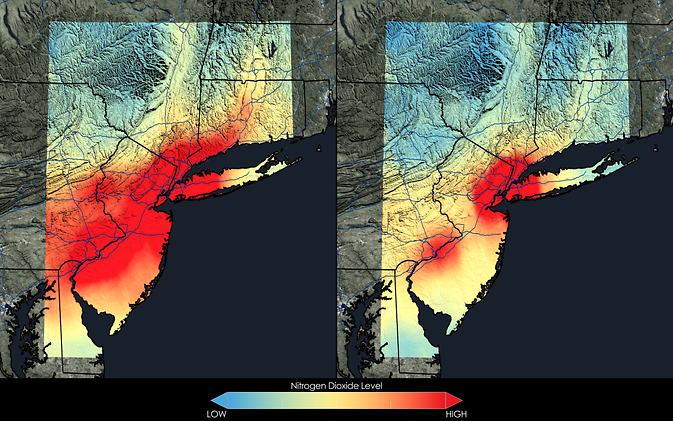 The harshest levels of nitrogen dioxide are still centered over the major metropolitan areas of the country, where roughly 142 million people in U.S. live, according to Popular Science. With The World Cup Underway, How Powerful Is Your Passport? Comments Off on With The World Cup Underway, How Powerful Is Your Passport? It might be one of the most common answers people give when asked what their city’s downtown needs: more parking. But there is a price cities pay in trying to accommodate the thousands of cars that come in and out of downtown cores around the country everyday. Parking lots have high costs to a city’s landscape, architecture, management and environment. It’s a concept called a parking crater. This is when an urban parking lot is placed in the middle of a downtown core, leaving a crater-like hole in a city’s landscape. 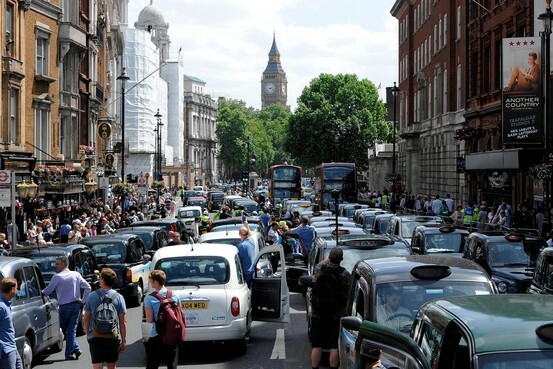 When tens of thousands of cab drivers took to the streets of major cities in Europe to protest of Uber this week, blocking streets, shutting down traffic and in some cases even becoming violent, an unexpected consequence may have come out of the protests called the ‘Streisand effect,’ according to Forbes Magazine. 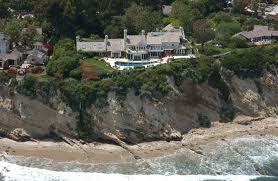 Contributor Tim Worstall writes that the Streisand effect refers to an incident years ago where singer Barbara Streisand tried to stop a photo of her home being posted online, which only brought more attention to the photo resulting in it being seen around the world. After demonstrations across Europe, the attention brought to Uber by its protestors may have had the opposite affect and instead helped grow its popularity. 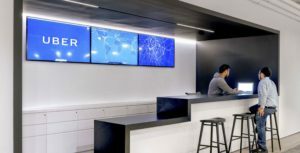 According to The Telegraph, Uber’s UK and Ireland general manager, Jo Bertram said the company saw and 850 percent increase in downloads in just one week.